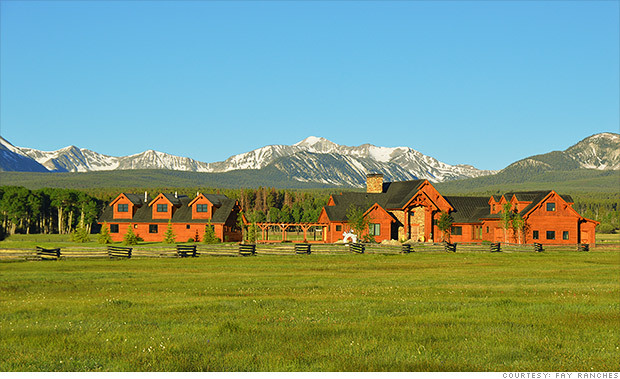 The Diamond Ranch lies on 3,000 acres of rich grasslands just east of the Continental Divide near Jackson, Mont. It butts up against a national forest and has its own resident elk herd, as well as deer, black bear, antelope and moose. A New York real estate exec bought the ranch in 2006 with an eye on spending part of his retirement there, according to Greg Fay, the founder of broker Fay Ranches. He completely refurbished the property with new roads, fences and lakes. He also upgraded the main lodge with wood floors, a stone fireplace and large windowed walls to capture the Rocky Mountain views. There's also a manager's residence, bunkhouse, guest cabin, equestrian barn and horse corrals.